Viewing time: 5 mins. 21 secs. The Write Question is a weekly video podcast all about writing. 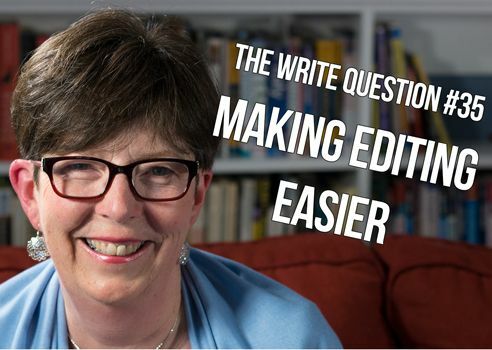 Today’s question focuses on making editing easier. Welcome to The Write Question, I’m Daphne Gray-Grant. Today we’re talking about how to make editing more rewarding. [recording] I have a question about your advice on how to stage editing after you have the first crappy draft. What I find is after I get the first draft of my whole paper, what I’ve been doing is going through section by section to edit things. What I’m doing right now is I’m editing each section trying to make it perfect before moving on and so basically my writing process is really slow and painful in that respect, and so I’m just wondering what advice you have in terms of more effectively editing after you have your first crappy draft. These are edits before you would edit for wordiness or sentence length. Any advice on that would be great. Thanks for your question, Tanya. I’m so glad you asked it because I think editing is the single most important step in the writing process — more important, even than the writing. The work of editing is what allows you to take something that is incomplete or inadequate and make it so much better. But I want to zero in on two concepts that you mentioned in your question. Addressing them, I think, will help make the work of editing less stressful for you. The first is the whole idea of trying to make something perfect. Please, let go of that concept, none of us can make anything perfect. That’s just outside of the human experience – we all make mistakes. All the time. Now maybe you don’t really believe that perfection is possible and it’s just a word you used but I want you to erase it from your vocabulary. Instead, promise yourself to do the best job you can. That’s a reasonable promise — and one you can live up to. The second concept I want to highlight is your statement that the editing process is slow and painful. You are not entirely wrong there; it IS hard work. But I think perhaps you’ve been surprised by how long it’s taking you. Obviously, if you give each step an equal amount of time it amounts to 33 and one-third for each. But few people give me that answer. Before I tell you what others say, let me ask you to pause this video and think about how you allocate your writing time. And write it down. [Pause in video]. Have you written it down? Okay, now I’ll tell you that the majority of people tend to spend most of their time writing. Many of them give it 60% or more. A small number of people spend more time preparing to write. Once, I even had one person tell me she spent 90% of her time preparing. Academics are particularly prone to overusing this category. These are the people who’ve fallen into the rabbit hole of too much time on research. But what really depresses me is that almost no one spends nearly enough time editing. Let me tell you what I recommend. I think the best, most fruitful division of labour gives preparation 40% of your time, writing 20% and editing 40%. I don’t manage to produce EVERYTHING I write, according to this formula, but I try. Notice the basic principle: editing should take twice as long as writing. So, if your editing is taking 10 times longer than the writing, perhaps you do have a problem. But if it’s in the range of twice as long, please understand that that’s normal and expected. It may be frustrating. But it’s normal. Also, keep in mind that it’s not necessary to edit in a chronological fashion. By that I mean, you don’t have to start with chapter 1 and work your way consecutively to chapter 23. Instead, dive into your manuscript or text in the spot that seems the most appealing to you that day. Editing is not meant to be punishment! And if your text has a thorny problem that you don’t have the strength to address that day, then don’t. Save the problem for another day when you feel stronger or have more energy. Becoming an effective editor takes time and practice. But remember, don’t make it more painful that it needs to be by using words like ‘perfect’ and by expecting too much of yourself. Thanks for your question, Tanya. I hope you have the chance to enjoy making some ice cream.